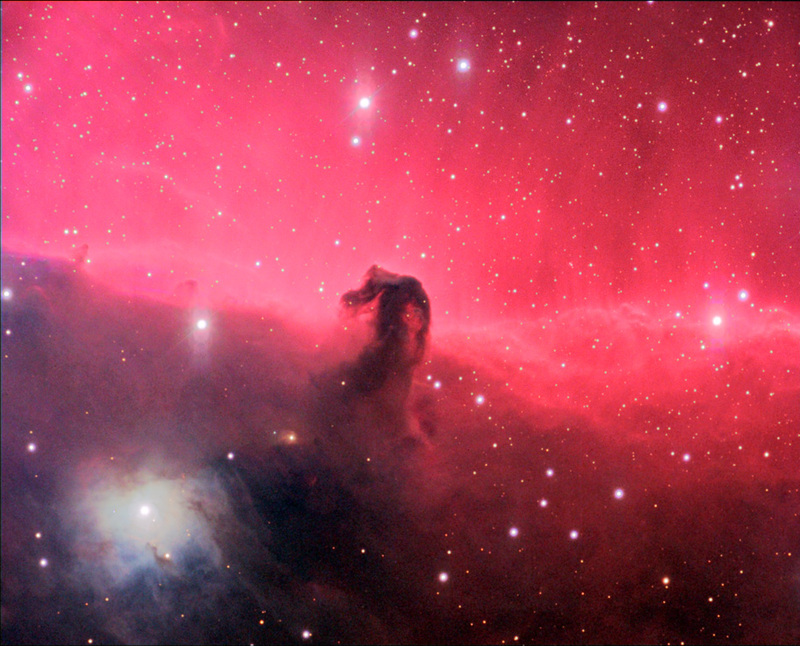 Description The Horsehead nebula (B33) is actually a dark interstellar cloud in our Milky Way that obscures part of a bright red emission nebula. This is IC 434 which is excited by bright Alnitak (Zeta Ori) just outside the field on the left (north). The blue reflection nebula NGC 2023 shines at lower left. The field of view is approx. 26' x 39'. Here is a higher resolution image taken with a 14.5" RC telescope. Location - Date - Time San Esteban (Chile) - 03Jan2003 - 04:00 UTC for G+R and 04Jan2003 - 04:00 UTC for B+L.